A healthy diet is what is right for you, depending on your specific situation. What is a healthy diet for a sedentary housewife will not be the same as for an elite athlete, workman or a breastfeeding mother. Whatever your particular circumstances, knowing what is in particular foods, and how to go about finding the right variety to supply your needs is important. A good place to start is to have a well-balanced diet. 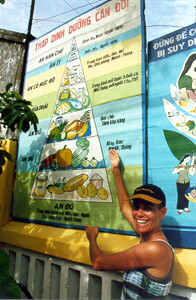 A well balanced diet with good variety ensures adequate intake of all the essential nutrients in the diet. All food groups should be included in the diet on a daily basis - breads and cereals, vegetables, fruit, dairy and meat. In addition to this, diversity within each food group is also beneficial. Breads and cereals contain carbohydrates, B vitamins and are an excellent source of fiber. A regular intake of a range of fruits, vegetables and herbs will improve the level of antioxidants and phytochemicals in the body. Antioxidants are known to help prevent inflammation, prevent some forms of cancers and viruses, aid in the prevention of heart disease, as well as anti-allergic effects. Dairy foods give maximum calcium levels for bone strength for the prevention of osteoporosis. Meat and alternatives provide an excellent source of protein, as well as iron and zinc. There are many healthy eating guidelines that have been published. To achieve a good healthy balance, one recommendation is that your diet should include one serve of meat each day, two serves of dairy products, three serves of fruit, four serves of vegetables and five serves of breads and cereals. 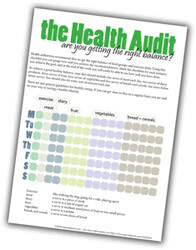 To assit you in following this guideline, we have developed an easy to follow checklist, called 'the Health Audit', a printable pdf which is available for free. Here are a selection of articles about knowing what food are good for you and knowing how to make the right choices when choosing what you eat. Healthy Guide to Eating Take Out / Takeaway - how to make a good choice when getting food to go. See also Eating Healthy Food at McDonalds. Organic Food — is it healthier for you? Restaurant Healthy Eating — getting the most out of what they have to offer. Getting good food variety — Choosing the right foods. No Nonsense Nutrition — Too many people consume great quantities of nutrient poor foods and only meager quantities of healthful foods. Wheatgrass Shots — are they as good as they are hyped up to be? Vegetarian and healthy? — how to stay healthy on a no meat diet.